Wirelessly connect up to 2 smartphones or tablets to the speaker and take turns enjoying powerful sound. Built-in rechargeable Li-ion 7500mAH battery supports up to 20 hours of playtime and charges your device via USB port. Take Charge 4 to the beach or the pool without worrying about spills or even submersion in water. Introducing the JBL Charge 4 portable Bluetooth speaker with full-spectrum, powerful sound and a built-in power bank to charge your devices. It features a proprietary developed driver and two JBL bass radiators that intensify sound with strong deep bass. Its high-capacity 7500mAh rechargeable Li-ion battery provides up to 20 hours of playtime. 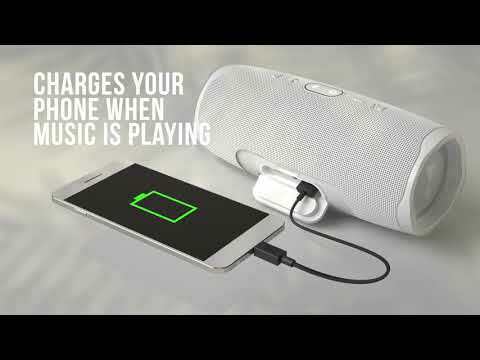 The speaker carries a convenient USB charge out to quickly charge your devices, such as your smartphone, so you will never run out of power again. The Charge 4 features a rugged design, IPX7 waterproof rated exterior and comes in a suite of cool colors. Together with JBL Connect+ it can wirelessly link more than 100 JBL Connect+ enabled speakers to elevate your listening experience. JBL Charge 4 is rated 4.4 out of 5 by 116. Rated 5 out of 5 by WOOD from Great sounds I recently bought this speaker, not only does the charge lasts a long time but the sound does too! Rated 5 out of 5 by Jaydadio from Great fidelity in a small package Great product easy to use. Flat out with charge 4, Impressed! Rated 5 out of 5 by DeezN74 from Awesome Took on spring break, beat the heck out of it on the beach, boat and pool and it still cranks out loud tunes. Rated 5 out of 5 by AvengingWizard from Simply Awesome! I bought this product about 2 months ago upgrading from the Charge 3 which I gave to my dad. I noticed the bass seemed noticeably cleaner than the 3 and overall has very good sound quality and is still compact enough to take most anywhere. I am very happy with the product. The power button however recently got stuck in the down position but i contacted support and they are working with me to get a replacement, and they made it very easy! I love these guys speakers very much, definitely the best I've used! Rated 5 out of 5 by Rob1999 from Great Bluetooth speaker JBL makes quality products. And this 4 th generation Charge Bluetooth speaker delivers great sound and long battery life. The ability to charge your devices is a plus! I highly recommend this top notch speaker to anybody looking for a rugged speaker that puts out quality sound! it's actually not, charge 4 is actually a little quieter then the charge 3, but if you havnt owned any charge speakers then it doesnt matter. Can you hear the sound from the charge 4 to the right because of the single driver ? Can charge 4 connect with charge 3? I have a jbl pulse 3. Should I upgrade to the charge 4??? how many watts does this speaker have on the battery?